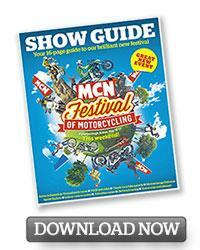 ﻿ Show Guide: Plan your MCN FESTIVAL weekend! The first ever MCN Festival of Motorcycling is here - and the excitement is simply electric. The weather is looking excellent, the site is prepared and ready for thousands upon thousands of motorcycling enthusiasts and we hope that you can join us too. It's not too late... Tickets are available on the door for both Saturday AND Sunday - AND DON'T FORGET, we have camping available all weekend too; so if you fancy grabbing your mates, chucking a roll bag onto the back of your bike and coming down for a truly unforgettable weekend then you ABSOLUTELY MUST! To make things a little easier, we've produced a sixteen page, show guide to allow you to plan your day and make sure you don’t miss anything by checking out the lay of the land at the Peterborough Arena. CCM, Harley- Davidson, Kawasaki, Suzuki, Yamaha, KTM, Triumph will be supplying bikes for you to try. Schwantz leads USA against a British dream team. PLUS: Don’t miss more dirt track action! Take in stunning custom bikes. Warr’s Harley are bringing some of their hottest machines and there will be a ton of other gleaming machines.